Properties in Serre di Rapolano average 4.7 out of 5 stars. 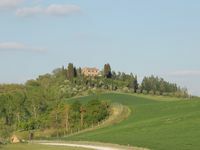 Holiday home San Pierino - Il Pozzo .. family vacation 15 minutes from Siena! Property 19: Holiday home San Pierino - Il Pozzo .. family vacation 15 minutes from Siena! Holiday Apartment San Pierino -Capanna .. family vacation 15 minutes from Siena! Property 30: Holiday Apartment San Pierino -Capanna .. family vacation 15 minutes from Siena! Holiday Apartment San Pierino - Stalla ... family vacation 15 minutes from Siena! Property 39: Holiday Apartment San Pierino - Stalla ... family vacation 15 minutes from Siena! My boyfriend &amp; I stayed in Villa Sara during our Spring Break, from March 12th-16th, 2017. To say we enjoyed our stay would be understatement. It was amazing. Ricardo was very accommodating, welcoming &amp; helpful. His wife is lovely as well! I wish we spoke more Italian. The land is beautiful, breathtaking &amp; very peaceful. We would wake up in the mornings and sit outside, on top of the hill, it was sunny. We would sometimes sit out there for hours at a time. There's nothing like it. The house is big and beautiful-like something out of a movie, out in the Italian countryside. The photos do not do Villa Sara justice. You have to be there to see how amazing it really is. We had fresh towels, soap, firewood outside (chilly at night), warm blankets, plenty of kitchenware to cook, and there is a big wood-burning stove downstairs in the living room area. There is a giant table and plenty of chairs to sit outside. We loved our stay and did not want to leave. I would recommend taking the cooking class with Ricardo &amp; his family. We regret not doing this because his family is so nice and welcoming. We were quite limited on days and had much to see, and the places were far to drive to. We will definitely come back here and will recommend to everyone. Thanks! !